Skyworks, through its wholly-owned subsidiary Isolink, is the leading global supplier of high performance, high quality and radiation tolerant optoelectronic components for aerospace, defense, medical, extreme industrial and high-reliability markets and applications. We pioneered the miniaturization of some of the most advanced optoelectronic components that operate in full military and space temperature ranges (-55°C to +125°C) and beyond. For the last 30 years, we have specialized in the manufacture of miniature hybrids and hermetically sealed optocouplers that offer high isolation voltage, high common mode rejection, high efficiency as well as fast response time to meet customers’ most demanding design and application challenges. 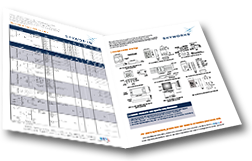 Over 50 standard and 500 custom optocouplers in a variety of hermetic, hybrid and custom packages are available with high-reliability screening per MIL-PRF-19500 or MIL-PRF-38534 specification.